Have you ever attempted to distress a pair of jeans, only to have your DIY project quickly turn into an at-home disaster? Don’t worry—we’ve been there. To avoid another denim dilemma, though, we looked to Madewell, a brand known for its denim expertise. After taking a trip to the brand’s Los Angeles–based washhouse and receiving tips from the head designer, Somsack Sikhounmuong, we can proudly say we’ve now mastered this denim DIY project—the Madewell way, of course! Scroll through to take a peek inside the brand’s denim-filled washhouse and learn what it takes to distress your jeans like the pros. Step 1: Decide on the distress level and location. For our DIY project, we decided on a heavy distress at the knees with patches of softer distressing around the pocket hems for a very worn-in vibe. According to Sikhounmuong, what distinguishes Madewell’s distressing process from other denim labels’ patterns is the brand’s attention to authenticity. “To start, we look for authentic, vintage-looking denim, and then make sure the placement of the patching or the sanding or the blasting looks like you owned and loved them for years,” he says. Step 2: Take your measurements. Once you’ve decided on the style of distress, you’ll need to measure your inseam to find out where you should create the first nick on your jeans. Make sure to start at the top of your inner thigh and measure to your true knee. To gauge, I’m 5’4”, and my inseam measured 12 inches to my true knee. Step 3: Make your marks. After you’ve found precisely where your knee will hit, draw a horizontal line about two inches wide with a piece of chalk. It’s important to draw this line because you want to break at the knee but not drill all the way to the outer hem. Step 5: Break open the knees. To enhance the level of distressing, pull the threads apart to help break open the knees, creating a more visible look. Start small—remember, you can always add to the effect. Once you wash and dry your jeans, they’ll look even more worn and torn. This step is all about personal preference. Do you want to add a bit of lived-in love to the corner of your pockets? Or tatter up the hems? Your call! Step 7: Wash, dry, and enjoy! 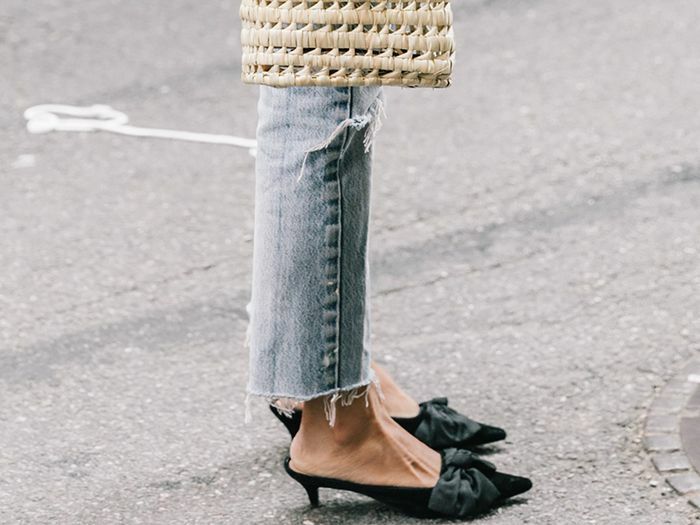 Keep reading to shop our favorite denim picks from Madewell and more below. Available in sizes 23P to 31P. Available in sizes 28 to 34.